These are samples of the replica brass employee tags for sale in the MSR&LHA Company Store. Each tag is 1.25" across and made of brass. The original tags were used at many logging operations in West Virginia because of the large number of immigrants working in the woods and in railroad construction. Unable to speak or write English, the tags enabled them to claim their time and receive pay. The number 2006 is to indicate the year the tag was produced (2006 is the 10th year in the series). 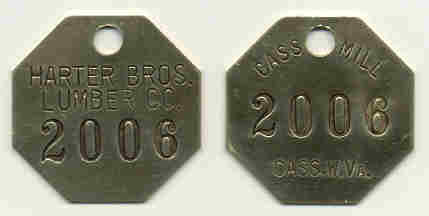 The series ended in 2016 since the Association is no longer running the Cass Railfan Weekends where the tags were provided as mementos to participants.